That's an interesting tidbit. Even though this is an instrumental version, I will weave into this thread that after the first two solos announce the "Shake" theme, the "Charleston" hesitation rhythm is then inserted. It is a nice rendition and a hot number. Don't forget. Charleston is the best dance after all. Since you posted this, I've been on the watch... and finally found an "E" condition copy yesterday. It really is a good one! Thanks for having mentioned it! 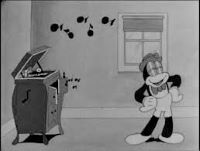 This song from 1929 references The Charleston and the Black Bottom as being "passé"
Good call- I was going to mention this one. Great record! I was thinking "Baltimore" mentions the Charleston too, but it's the Black Bottom that's mentioned.